Brand Names: Prilosec, Zegerid. Some of the more common side effects of Omeprazole may include headaches, constipation, nausea and fatigue. There are also some more serious, but rare side effects which include and are not limited to rapid heartbeat, inflammation of the pancreas, and depression. Side effects in babies commonly include diarrhea and ear infections. Some of the other Omeprazole side effects, which have more to do with mental health disorders, are depression, agitation, aggression, hallucinations and confusions. There are also complications that can result from low magnesium that is caused by the medication, which are muscle spasms, irregular heart beat and possible seizures. The only possible side effect that could be different for women is in women who are pregnant or nursing. That being said, no specific risks have been found, however not enough research has been done in order to know if Omeprazole is actually safe for women during pregnancy. Therefore, the FDA suggests that women who are pregnant refrain from taking this medication as it could possibly harm the baby. Some women have taken Omeprazole during pregnancy, but this was done under the strict guidance of a medical professional; no known complications have been reported. 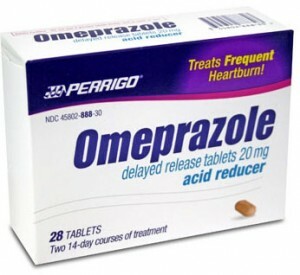 Omeprazole, which the FDA has approved as being safe for babies, is often used to treat acid reflux. A possible side effect of Omeprazole in babies more commonly includes diarrhea, which can be reduced by giving Omeprazole one hour before breakfast, while at the same time ensuring that the baby gets plenty of fluids to prevent dehydration. Gas, nausea, and vomiting can also accompany the diarrhea. Another side effect in babies includes ear infections, which can often lead to other health issues such as a blown eardrum, or an upper respiratory tract infection. Finally as with any new medication that is given to a baby, it can also cause allergic reactions. Although Omeprazole does have some side effects, they are usually infrequent and are commonly harmless. Since this medication has been shown to help with acid reflux and other gastrointestinal disorder tremendously, most people would probably find that the benefits outweigh the small number of side effects that do exist. Most people who take Omeprazole will not get any side effects at all. Because of unknown side effects to their unborn child, the only people who are suggested to avoid it are women who are pregnant.